Use the Content tool to post and organise unit content so that information about unit expectations, unit study guide, lecture notes, and important dates display to users clearly. Unit materials you post in Content can include documents, images, media files, URL links, and existing unit activities. You can add release conditions, and grade items to topics to ensure users navigate through unit materials while fulfilling specific unit requirements and learning expectations. You can also monitor class and user progress as students work through unit content by setting automatic (determined by the system) or manual (determined by the student) completion tracking. 1) When users access a unit's Content tool for the first time, the first page they land on is the Overview. Use the Overview page to orient users to the unit, content materials, and unit expectations. Upload your Unit Study guide to the Overview page as an attachment. If you decide not to add anything to this page, the Overview link and page is hidden from learners' view. 2) Topics you bookmark appear in a list on the Bookmarks page. The number beside the Bookmarks link indicates how many bookmarks you have. 3) The Unit Schedule page lists unit material due dates, start dates, end dates, overdue unit activities, and other unit events for the next seven days. If you set availability dates or a due date for a unit object, it appears in the Unit Schedule page and the Agenda view in the Calendar tool. If you set a due date for a unit activity that has no end date or it has an end date that occurs after the due date, the activity appears on the Overdue tab for learners who miss the due date. The Overdue tab lists overdue unit activities that learners can still complete before the item or unit becomes unavailable. The dates listed on this page are not exclusive to content topics; upcoming events include all events within the unit from the Calendar tool. The number beside the Upcoming Events link indicates how many upcoming events you have. 4) The Table of Contents panel lists all modules available in your unit. The number beside each module name in the Table of Contents panel indicates the number of topics you have set completion tracking for. The number beside the Table of Contents link indicates the total number of topics you have set completion tracking for. Use the number totals to determine the task load being put on learners per module. 5) The unit content administration options located on the Table of Contents page allow assemblers to import and copy unit content, bulk Unit Admin content properties, manage unit files, view reports on unit content, and restore deleted unit items. Your unit content is organised using modules and content topics. Use modules to organise the broad subject areas of your unit offering (for example, the topics covered in the unit like Identify Customer Needs, Deliver a Service to Customers, Monitor and Report on Service Delivery, and so on). Use content topics within a module to organise the specific materials of each module (for example, documents or web pages like How to identify and clarify customer needs and expectations, Delivering a quality service, Understanding your customer who has special needs and so on). Organizing your unit in a way that supports the learning needs and styles of all users can be a difficult task. Your learning materials need to engage, educate, evaluate, and accommodate people effectively. Use the Content Overview page to help familiarize your learners with your unit content. Add your unit study guide to the Content Overview page. This helps all users clearly understand your unit expectations up front. If possible, link each item to the actual item in your unit. This provides a navigation shortcut to important content and helps students with learning disabilities clearly see how unit content relates to unit expectations. Set up enumerations in the Content tool's Settings to establish a clear hierarchy in your unit content. Well-defined unit structure is easier to navigate for screen reader users and learners with learning disabilities. Provide readings well in advance of deadlines so users can work ahead and prepare. Many learners need the extra time to read through content multiple times. If you use release conditions to control when to release unit content on a module by module basis, make sure you give learners plenty of time to complete each component. One of the most effective unit design decisions you can make to improve engagement is to offer unit materials that appeal to more than one sense. For example, the same material can have an audio, video, and text component. This type of redundancy helps engage learners with different learning types, reinforces important concepts, and helps ensure that users with physical disabilities can access content in a suitable format. Use the Content tool for readings and unit material. HTML code is easier for assistive technologies to interpret than application-based files such as Microsoft Word. Follow web standards when creating your content. If you need to use PDF files for additional content, use optical character recognition (OCR) if you are scanning documents so the text can be read by screen readers. Also consider adding tags to your documents to enable screen reader users to navigate them more easily. For more information about PDF accessibility, go to http://webaim.org/techniques/acrobat. If your readings and lecture materials use many graphics, tables, videos, or audio recordings, provide a text-only alternative. Text-only material should supplement, not replace, other delivery methods. Videos, graphics, and audio files are a great way to generate interest in a topic, present material from different perspectives, and help students with learning disabilities through redundancy. Make the text-only alternatives easy to compile for print so that all learners can use them as study aids at their leisure. Most of the following tips provided are web content standards set by the World Wide Web Consortium in the Web Content Accessibility Guidelines and should be considered when creating HTML content. Use a simple layout that does not organise content in tables or columns. Simply organised material is easier for learners to read and understand, is easier for assistive technology to interpret and present, and is easier for mobile and handheld devices to resize. Use headings to communicate the relationships between sections. Use Heading 1 for the title, Heading 2 for major sections, Heading 3 for subsections, and so on. If headings are used correctly, screen reader users can quickly search a page by heading and participants with cognitive disabilities can understand how sections and content relate easier. Make sure each heading is unique. Do not use the same text for a Heading 3 (subsection) that you used for your Heading 1 at the start of the document. The same principle applies to file/item names. Make sure each file or item you create has a unique name. For longer topics, include a table of contents that links to each section and "Back to top" links at the end of each section. Include alternative text descriptions (alt text) for all graphics. Use double quotes (null) "" as the alt text if the object is a decorative element that does not add meaning. If the graphic is a link, begin the alt text with "Link to". The HTML Editor in Connect automatically prompts you to include alt text when you insert an image. Include detailed captions below tables and graphs. These captions should explain what the objects convey, including important trends and statistics. This will help all learners interpret the objects. For tables, include a caption using the caption element that explains how the table is organised. Check that tables make sense when read from left to right. Screen readers have difficulty conveying information that reads from top to bottom. Use the same text on-screen and in the alt text for links. Make sure the text describes the action that will occur. Never use text such as "Click Here" as the link. Screen reader users often use a list of links to quickly navigate actions on a page; this is not possible if links are not descriptive. Include text alternatives of multimedia content, such as audio or video files. If you do not have the time to create a complete text alternative, include a descriptive label that summarizes the content. Do not use blinking or flashing multimedia as it can cause seizures in individuals with photosensitivity. Use animation when it helps convey a concept and not to draw attention to an unchanging object. Use a combination of size, color, and prominence to draw attention to objects. Never use only color to convey meaning. If you want to show how concepts and objects relate to each other use a combination of size, color, and text labels. Ensure there is a strong contrast between the text and background colors used in your unit materials. Use relative font sizes and make sure the text and page layout adjusts when font sizes are changed. Users should not have to scroll horizontally. If you create PDF documents from Microsoft Word or another word processor, make sure you format titles and sections using headings so they are tagged correctly in the PDF. If users can use text-to-speech software to read text aloud or highlight text as they go through it, test the software to ensure it functions correctly for specific tools and settings you want to create. For example, disabling right-click in quizzes can prevent some text-to-speech software from tracking text, so try your software to see if you experience similar issues. Take advantage of D2L-compatible tools, such as OpenDyslexic font, ReadSpeaker, Visual unit widget, and audio topics. What kinds of files can I use for unit content? You must create a module before you can add topics. You can create submodules (modules within existing modules) to establish a deeper hierarchy. If your unit is SCORM 2004-compliant, new modules that you create are outside the sequencing and navigation built into the SCORM package. On the navbar, click Content. In the Table of Contents panel, in the Add a module field, enter the name of your new module and then press Enter. To add a submodule, click into the module. In the Add a sub-module field, enter the name of your new sub-module and then press Enter. In the Table of Contents panel, click on the module in which you want to create a new topic. To add a video or audio topic, click Video or Audio. To add existing files from your computer, unit offering files, or Shared Files area, click Upload Files. To add a new file, click Create a File. To add a link, click Create a Link. To add existing files from Manage Files, click Add from Manage Files. To add a new checklist, click New Checklist. To add a new discussion topic, click New Discussion. To add a new assignment submission folder, click New Assignments. To add a new quiz, click New Quiz. To add a new survey, click New Survey. Follow the prompts on the screen to modify your new topic. To add an existing chat, click Chat. To add an existing checklist, click Checklist. To add an existing discussion topic, click Discussions. To add an existing assignment submissions folder, click Assignments. To add an existing quiz, click Quizzes. To add an existing self assessment, click Self Assessments. To add an existing survey, click Surveys. Note: Additional menu options may be available depending on your institution. To insert an existing activity, in the Add Activity window, click on the activity. To create and insert a new activity, in the Add Activity window, click Create New [activity]. Enter your activity details and click Create and Insert. You can add subtitles to uploaded videos by uploading an SRT or WebVTT file. You can also attach more than one subtitle file to a video to accommodate more than one language. This can make your video available to a broader audience. Subtitles appear to students as closed captions within the video player and they can decide if they want to view the video with subtitles enabled, as well as which of the available languages they want to use. Subtitles are not automatically generated for videos, and they are not automatically translated into different languages. The closed caption file uploads into a subfolder in the same location as the video file. You can only add subtitles to the videos that you upload. If you want to include subtitles for web videos hosted on another site, such as YouTube, you must follow the practices of that site. In the Table of Contents panel, click on the module in which you want to create a new video topic. From the Upload/Create button, click Video or Audio. In the Upload tab, upload your video. From the Subtitle Language drop-down list, select a language. To upload the SRT or WebVTT file containing your close captions for the video, click Browse. Locate your file and click Open. Hello, I’m James. Welcome to this presentation. Today I will be speaking about changes in eLearning technology. This is a thirty minute seminar. If you wish, you may take notes during this presentation. In the Content tool, you can arrange your unit content by dragging and dropping modules and topics using the module or topic's drag handle ( ). If you drag a module or topic above or below other modules and topics, a gray line appears to indicate you can drop the module or topic there. If you drag a module or topic over another module, the module appears orange to indicate you can drop it there. You can also automatically update your existing files by dragging the newest version of your file from your computer into the appropriate module. When a module contains no topics, an upload target displays. If you drag a file over an upload target, that area appears orange to indicate you can drop it there. When a module contains topics, you can still drag a file into it. A horizontal line indicates where the file will be dropped, allowing you to create new topics between pre-existing ones. You can also drop files from your computer directly into the Table of Contents panel. Internet Explorer 9 and older currently do not support dragging and dropping files from your desktop into Connect. From the unit home page, click Content. Click the content module or sub-module for the topic you want to create a quicklink in. From the context menu of the topic you want to add a quicklink to, click Edit HTML. In the Content editor, enter the text you want to hyperlink to, highlight the text, and then click the Quicklink icon. In the Unit Materials dialog box, click Discussions. To add a discussion forum, click the Insert icon for the forum. To add a discussion topic, click directly on the topic. In the module or sub-module you want to add the quicklink to, click Existing Activities and then Discussions. To add a discussion topic, click the topic. If you set a module's status as draft, the module and all its topics are hidden from students. To set a topic's status, on the Table of Contents page, from the context menu of the topic you want to set, click View Topic. In the Activity Details tab, from the status drop-down list, select either Published or Draft. To set a module's status, from the Table of Contents panel, click on the module's name. From the status drop-down list, select either Published or Draft. You can create a new HTML document based on any existing HTML file. If you set up a path to a directory containing HTML templates in Manage Files, these template choices appear in a drop-down list when you create a new document. All links to assets such as images, CSS, and JS files are maintained when you create a new HTML document from a template in Content. Therefore, you can build many documents from one central template housed in the template directory, with standard styles and images already included. If you have already created an entirely new HTML document, you can save it in your template directory for other documents. TAFE Queensland uses the TAFE Queensland Development Starter Kit (based on Bootstrap 3) as the basis for building responsive HTML-based eLearning content. In the Content Authoring area, select the Enable HTML Templates check box. If you want to change where your templates are located, click Change Path. Select your new location, then click Select Path. On the Table of Contents page, from the Upload/Create button of the module you want to add a new document with an HTML template attached, click Create a File. If you have a defined template directory, from the drop-down list, click Select a Document Template. If you do not have a defined template directory, click Browse for a Template. Locate the template you want to use, then click Add. Customise your topic according to your needs. To publish your topic, click Publish. To save your topic for further edits, click Save as Draft. You can edit SCORM packages with the same options that are available when you create content topics. Although you can add a grade item to a SCORM object, completing a quiz included in a SCORM package automatically generates a grade item in the grades list, populated with the quiz results. On the Table of Contents page, click on the SCORM topic for which you want to create a grade item. In the Activity Details tab, in the Assessment area, click Add a grade item. Enter a Points value for the grade item. To add an existing grade item, from the drop-down list, select your item. To create and attach a new grade item, click the New Grade Item icon. Enter your new grade item's details. Click Create. You can remove the sequencing and navigation rules from a SCORM package if you want to use some of the modules or topics in another unit, or reorder modules and topics in the current unit. Removing sequencing and navigation from a SCORM package resets progress tracking for those topics. From the Table of Contents panel, click on the module from which you want to remove simple sequencing. From the context menu of the module, click Remove Sequencing. Why are YouTube videos and other embedded media using Insert Stuff not working/loading? When using the Insert Stuff framework to add a YouTube video/other embedded media in a Content frame, the Firefox internet browser blocks the content because it is unsecure without informing the user that there is actually an invisible block around where the media should be. This makes it appear as if the insert failed even though the browser is actually blocking the unsecure content. To resolve this issue, the URL that is linked from within the Content frames must use https:// and NOT an http:// URL. If the destination site doesn't have an https:// URL, then you might reconsider linking to this content. If it is necessary, ensure that your students know that they need to enable the ability to view unsecure content. Why can't learners see the Content I posted? From the unit homepage, click Content. Select the Content module/sub-module from the contents section. If learners can't see a content topic, click the topic's context menu and select Edit Properties. Click Add dates and restrictions. Ensure that the start and end dates set on the Content Module / Topic are accurate. If there is a start or end date set on the Content module / topic that wasn’t intended, remove the dates filled in the Start Date and End Date fields so that they are blank. Under Release Conditions, ensure that the release conditions set on the Content Module / Topic are accurate. If there are release conditions set that weren't intended, remove the release conditions by clicking the Delete icon. 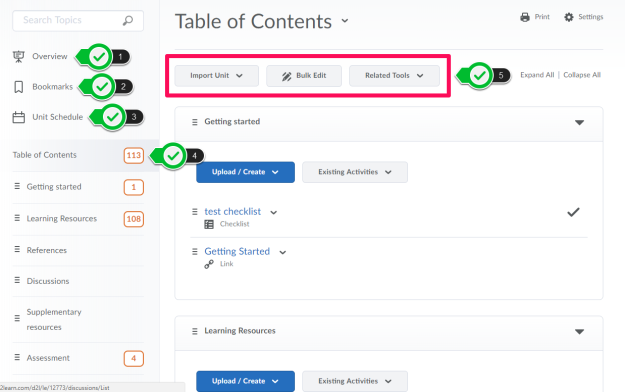 If the start date, end date, and release conditions are set accurately, and learners still can’t view the Content module / topic, then the reason the learners cannot view the Content is due to them not having met the release conditions to be able to view the Content.